Woods, a gentle stream, the possibility of encountering wildlife, and easy hiking are reasons why the trail in Sanilac Petroglyphs Historic Site is such a good family outing. 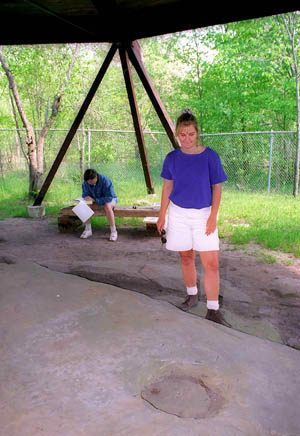 But what makes it an excellent adventure for children is the way the historic artifacts fill young minds with images of ancient hunters, Indian villages, and nineteenth-century loggers.The main feature of the park is a large slab of sandstone with dozens of carvings dating back to the Late Woodland Period. Known as petroglyphs, these carvings are the only such ones ever found in Michigan and were discovered after massive forest fires swept the Lower Peninsula in 1881. Woods, a gentle stream, the possibility of encountering wildlife, and easy hiking are reasons why the trail in Sanilac Petroglyphs Historic Site is such a good family outing. But what makes it an excellent adventure for children is the way the historic artifacts fill young minds with images of ancient hunters, Indian villages, and nineteenth-century loggers. The main feature of the park is a large slab of sandstone with dozens of carvings on it that archaeologists believe to be 300 to 1,000 years old, dating back to the Late Woodland Period. Known as petroglyphs, these carvings are the only such ones ever found in Michigan and were discovered after massive forest fires swept the Lower Peninsula in 1881. Native Americans created this unusual artwork and today they provide a glimpse into the lives of an ancient woodland people who once occupied Michigan's Thumb area. From the petroglyphs a 1.5-mile trail winds through the 240-acre state park unit. Scattered along the trail are five interpretive panels that explain the ecology and early history of the area. At one point there were 10 numbered posts along the trail that corresponded to an interpretive brochure. Today most of the posts, if not all, are gone as well the brochure. This is an easy hike that takes most families an hour or two to enjoy the carvings and walk the trail. In the spring parts of the route can be wet to the point where the streams might be even lapping over the bridges. From the parking lot it’s a 0.25-mile walk along a crushed limestone trail to a large pavilion that has been built over the slab of sandstone. 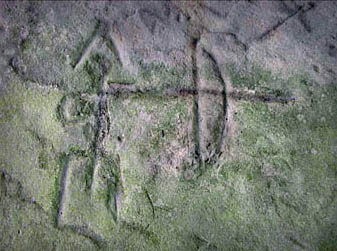 Most of the carvings—outlines of hands, animal tracks, birds, and spirals—are not visible at first glance. A display near the entrance shows their locations, and the best viewing is on overcast days when you can use a flashlight to illuminate the petroglyphs from the side. But even children can guess the most prominent one—a bowman with a long, single arm depicting both his arm and arrow—and it’s fun trying to figure out what the rest could be. Deer? Hunters? Mythological creatures, maybe? With such a great start to the walk, some young hikers head up the trail half expecting a tipi around every bend. There’s no tipis but a few steps from the rock carvings is where the “council circle” was located for a Chippewa tribe that once had a village here. Within a half mile from the start are surface rocks with large, round depressions believed to be mortars that Indians made to store and protect food. The mortars were easy to make—the Indians simply pounded the soft sandstone with round, hard rocks. Larger mortars are just down the trail at Thunder Rock. At this point the trail curves south, close to South Fork Cass River, and passes through a lowland forest. The large maple trees arching over the river are impressive in the fall, but come spring this can be a muddy section. The moisture and mud, however, encourage a profusion of wildflowers in May and June, when the trails are crisscrossed with easy-to-identify deer tracks leading off in every direction. In a little more than half mile from the pavilion, the trail crosses a swing bridge over the river; on the other side was the location of Temple Dorr’s cabin, a timber cruiser who lived here in 1835. Just up the trail is a rock outcropping where loggers once rolled logs down into the river to float them to the Saginaw mills. The trail passes some impressive birch trees and then emerges into a semi-open area for the remainder of the hike. 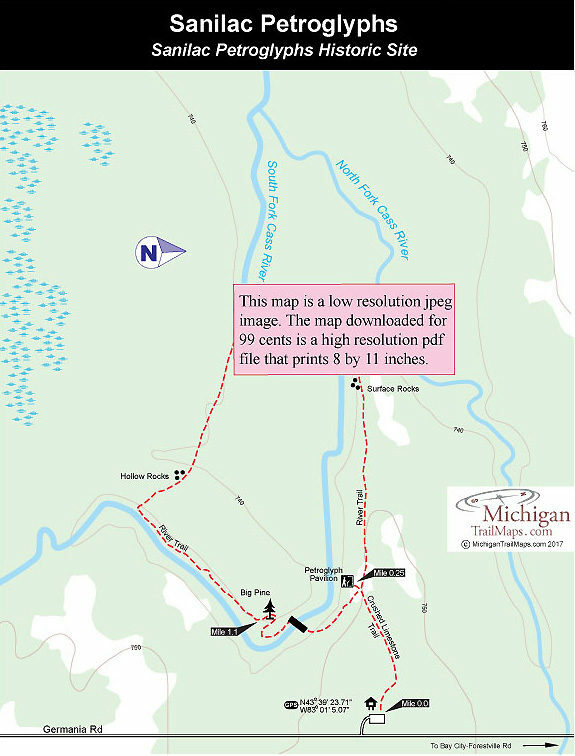 It was in this area that the Chippewa village was located. As late as 1900 Indians from a Caro reservation spent the summer months here while they picked and dried wild berries. If you search around, you can find more mortars. Just beyond Mile 1 is an impressive pine that is the lone survivor of the Great Fire of 1881, an event that closed the chapter on logging in Michigan’s Thumb region. From the Big Pine, great place for a snack, you return to the river and cross to the other bank on another swing bridge. The pavilion is now only minutes away and from there you backtrack to the parking lot. The Sanilac Petroglyphs Historic Site features a pavilion protecting the ancient rock carvings, interpretive displays and a parking area. There are the no entrance fees at Sanilac Petroglyphs Historic Site. The park is open Wednesday through Sunday, 10 a.m. to 5 p.m., roughly from Memorial Day to Labor Day while twice during the summer the Michigan Historical Museum stages an open house that feature guided tours. Contact Sleeper State Park (989-856-4411) for exact dates and times. Contact Sleeper State Park (989-856 4411; www.michigan.gov/sanilacpetroglyphs).